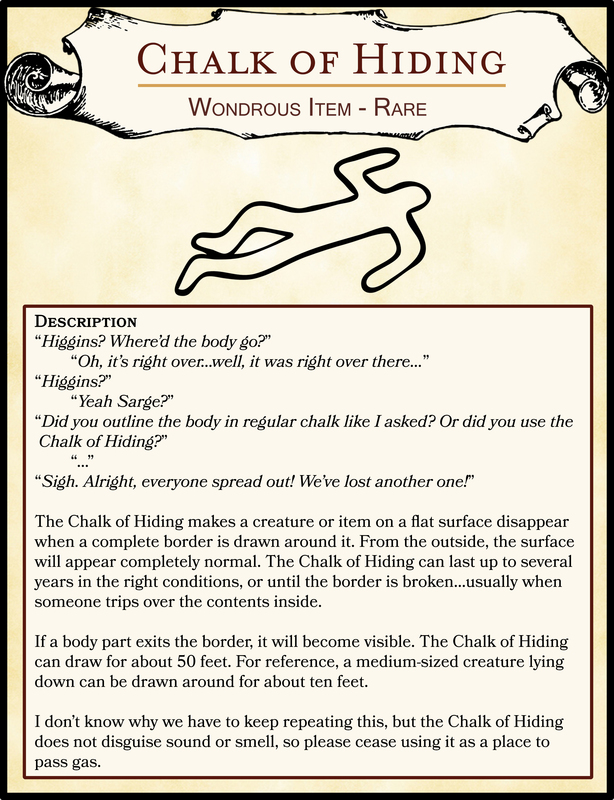 The Chalk of Hiding makes a creature or item on a flat surface disappear when a complete border is drawn around it. From the outside, the surface will appear completely normal. The Chalk of Hiding can last up to several years in the right conditions, or until the border is broken…usually when someone trips over the contents inside. If a body part exits the border, it will become visible. The Chalk of Hiding can draw for about 50 feet. For reference, a medium-sized creature lying down can be drawn around for about ten feet. I don’t know why we have to keep repeating this, but the Chalk of Hiding does not disguise sound or smell, so please cease using it as a place to pass gas.